Interchange Madrid is finally here! Today was officially day one of the event (although we had additional partner events on Sunday and Monday). Signs were displayed, rooms were checked into, and sangria was sampled – we were ready! This is the second year we’ve had an additional Interchange event located in beautiful Madrid, Spain. Over 50 percent of Ivanti’s employees and customer base lives outside of the USA, so it makes sense to bring together our awesome European partners and customers for a week of learning, networking, and exciting announcements. Each day this week, I’ll be summarizing the day’s highlights for all of those who couldn’t make it and are feeling the #FOMO. And it goes without saying, the food, the drinks, and the siestas are the chocolate on top of the magical churro that is Interchange Madrid. We kicked off the day with a keynote hosted by CMO Steve Morton, and he started by interviewing CEO Steve Daly. They discussed their vision to unify IT and what Ivanti has done in the past years to meet that goal. In 2016, Ivanti acquired Xtraction to focus on reporting. In 2017, Ivanti acquired RES Software to add automation to our technology. In 2018, we introduced our Enterprise License Agreement (ELA), which allows customers to easily purchase Ivanti products. So what is Ivanti doing to innovate in 2019? During the keynote, we announced Ivanti Cloud. Ivanti Cloud is all about discovering, providing insight, and taking action. It includes technology such as Real Time, Smart Advisors, and machine learning. "The cloud is the mechanism where unifying IT happens,” Morton said. Following Daly’s mantra, “innovate or die,” Ivanti Cloud is all about adding value, not pressuring you to change all of your processes. “The problems we’re trying to solve don’t fit into a silo. How do we take different pieces, bring them together, and solve real world problems? That’s what unifying IT is all about, and why we created Ivanti Cloud,” Steve Daly said. The keynote closed with an interview of Tom Davis, CTO, and Duane Newman, VP of Product. They showed four different demos of how Ivanti Cloud works to identify and solve real life problems, such as slow computers, identifying how many devices you have, logon times, and dealing with security issues. During the keynote, we also talked about our new program, Ivanti Cares, as well as our recent partnership with 5 For The Fight. The audience participated in an emotional demonstration. Daly asked those who have personally been affected by cancer either themselves or with close friends and family to turn on their cellphone flashlights. The entire auditorium was filled with lights in this powerful moment where we were all reminded that no matter where you are from, everyone is impacted by cancer. The keynote was followed up with an opportunity for the women of the conference to meet together and network. This session had over double the attendance from last year, and we love seeing how this movement has grown! Visit out Women in Tech category for a bunch of great content on the subject, and join the conversation on Twitter @TheTechieGirls. To start the breakout sessions, we ran four “State of the Union” addresses: IT Asset Management, IT Service Management, Security Controls, and Unified Endpoint Management. During these sessions, we talked about where our products and technologies are headed, IT industry predictions, and take a look at innovations from the year past. We had so many awesome breakout sessions to choose from (I finally understand Herminone Granger’s use of a Time Turner to go to extra classes in school). Some highlights were a session introducing our new product, Ivanti Security Control. We had three sessions all about Windows 10 migration. We featured a customer panel where we discussed their IT transformation journeys and how they found success. We broke down Patch Management Best Practices for 2019, one of our most popular sessions. Beyond these sessions, there was so much more! The night ended with a gorgeous welcome reception themed around Madrid’s classic markets. The room was transformed into a market hub, filled with street music, intoxicating aromas, string lights, tapas as far as the eye can see, and of course, Spanish wine. All in all, the day was a huge success! 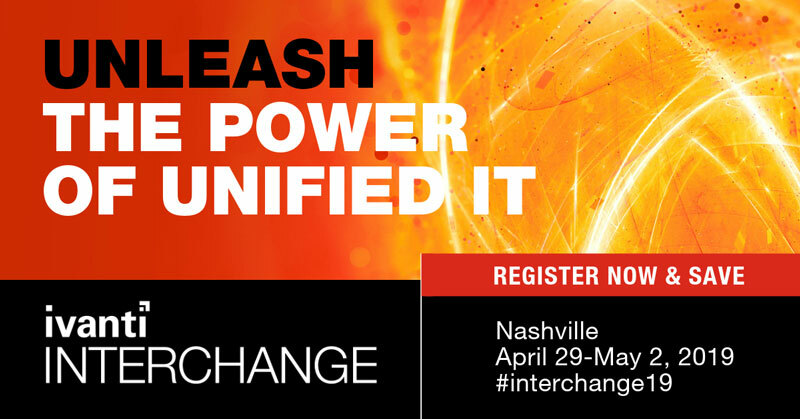 Learn more about Interchange and register for Interchange Nashville below.